Here is my final entry for the 2016 Card Design Superstar Contest over at MFT Stamps. They are giving away ten $250 gift certificates and naming 10 Card Design Superstars. Maybe THIS card will be the one that catches their eye....let us pray. For my pair of tropical birds, I used the Birds of Paradise stamp set. I colored them in fun colors that compliment all the sequins in my shaker bird cage. 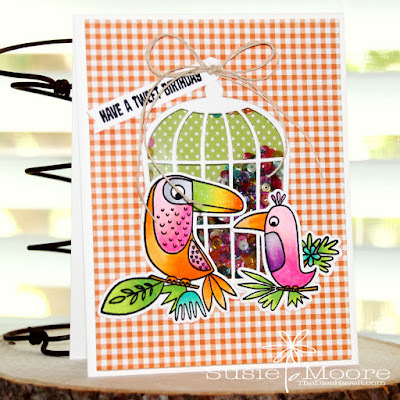 My birdcage die cut is from MFT Stamps too, but it has been retired. If you check the website, they have another bird cage die that is even fancier and you will love it. 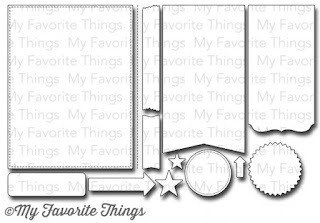 For my checked panel, I used the large stitched rectangle from the Blueprints 13 die set. This is a great set and I use it all the time! I love making shaker cards. And adding these adorable birds made it even more fun! Wish me luck and I'll let you know if I win!!!!! !